Just like there were Kings, Queens and there were Legends, there are leaders and there are Titans in Toastmasters. Amongst us we have one such person who has always been the leader but was recently christened to be a Titan. By now everyone must have guessed it correctly; I am referring to our former Division D Director Dr. Alifiya Lakdawala. Don't run behind success, try to achieve excellence and success will follow you. This very apt quote rightly describes Dr. Alifiya Lakdawala. Her sincere dedication coupled with spirit of team building and hunger for excellence led us to achieve so many milestones under her astounding leadership. Under her guidance Division D won many accolades. Her vision was not to win or set benchmarks, but to nurture and build a self-reliant robust team with resilience, persuasion, commitment, integrity and honour. The result is out there for everyone to witness - She has been felicitated and conferred as the Best Division Director in the entire District 20 for the term 2017 – 2018. District 20 formerly comprised clubs from Bahrain, Kuwait and Qatar. She was not only the director of division D, but a friend, philosopher and a guide to all her team members. She rightly deserved every bit of the esteemed award presented to her. This achievement is not just any feather in her cap; it is just another feather in her overcrowded and over shrouded cap of achievements. Concluding her thanking note with special thanks to former Division I Director Fatema Abdullah and her team for the camaraderie extended. 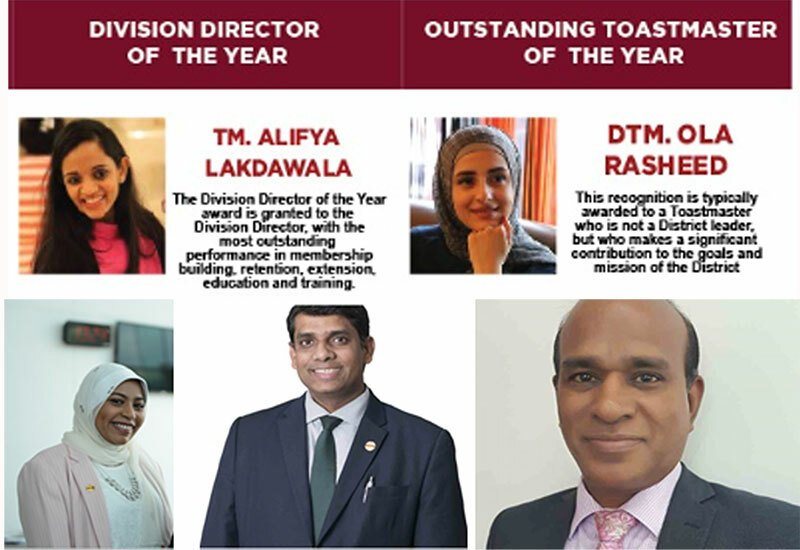 Recently crowned as Distinguished Toastmasters Ola Rahseed was awarded as “Outstanding Toastmaster of the Year” in the entire District 20 for the term 2017 – 2018. This recognition was bestowed upon her for her significant contribution to the goals and mission of the District despite not holding any district level leadership position. DTM Ola Rasheed is yet another example of Selfless Service that brings the core value of Toastmasters. Yet another example of outstanding leadership in Toastmasters is the present Division E and F directors, Mr. Ram Kumar and Christy Kulathooran. Together as team, Division directors Ram Kumar and Christy Kulathooran have been fuelling Kuwait toastmasters with umpteen opportunities to grow, learn and excel. We wish them all the best and look forward to another year of stupendous achievements. If you too want to become an outstanding leader, a person whom everyone looks up to and is an idol to many, then toastmasters is the right platform for you to develop your personality. Toastmaster international provides a supportive learn-by-doing environment that allows everyone to achieve their goals. It offers everyone an equal opportunity with that help to develop and accelerate speaking skills along with honing leadership proficiencies. If you, your family or friends wish to be part of this exciting journey of ever evolving and want to stand out as tall leaders, people who can think out of the box and can speak on any platform then this is just your perfect gateway. “The woods are lovely, dark and deep. But I have promises to keep and miles to go before… ”, rightly quoted by Alifiya Lakdawala for all the future and budding toastmasters to stay motivated. Signing off ex-Division D PR, Farhan. Nice to see all DTM ''s working hard with a dedication to see all TM''s to be successful in their leadership endeavors...kudos to DTM Mr. Ram Kumar ..proud of his energy levels and commitment at Toast Masters sessions round the clock..
One of the most active, vibrant and noise-less TM with a great leadership abilities, DTM Ola Rashes reached Pinnacle of her TM success, with lot of dedication and highly liked by one and all. Right Award for the Right Person. Great to know TM Alifiya Lakdawala has been duly recognised for her great leadership skills. I know her since the day she became a Toastmaster and gave her Ice Breaking speech, which was unique and innovative. Congratulations to her for this award and wishing many more accolades in her TM journey.